Several of my coworkers are all about Balblair. Unfortunately it's not legal to sell in Michigan any more so they've taken to buying it online. Courtesy of them I've gotten to sample all sorts of Whiskey, Scotch, Bourbon, & Cognac. A few weeks ago we went to this activity. Why is it illegal? Is that product hazardous to human health? I'm of the same mind as Lunar. Why was it made illegal? Actually, scratch that. I don't think I'm even old enough to legally talk about this stuff yet. You got me. Each state has all sorts of silly rules about the sale of alcohol. They probably didn't sell enough of it, so when their license / authorization to sell in Michigan lapsed they didn't renew it and it became illegal to distribute. Am I the only person in the world who has consumed no liquor and has had maybe 15-20 beers over the 25+ years of the "legal drinking age" part of my life? Nope. I drink a little wine now and then, but that's about it. I always thought the hard liquor was for guys born in the 40s or earlier, but I guess not. I suppose there was some resurgence during the 80s with the yuppies and it continues. Of course there are millions of alcoholics, too. If you lived in Australia, that might quite possibly be true. Or the UK, France, Italy, Germany, Spain ... I guess a lot of countries, really. Hard liquor is expensive here, but widely available unless you're under 18 (in which case your older friends have to buy it for you). When I saw Stereodude's slight lament regarding Balblair, I assumed liquor restrictions in Michigan must have reduced domestic violence when compared to Australia. But no, per capita it's double. That's not to detract from the fact that Australia has a massive binge drinking problem, particularly among younger people. I'm sure there are plenty of Muslims and Mormons who can best your "achievement". I'm not a big drinker, but I do like a top shelf margarita with Cointreau and Grand Marnier. I also like some of the hard ciders (Strongbow, Crispin Pear, Magners). I expect the domestic violence crowd isn't buying >$50 bottles of Scotch to get blitzed and then beat their significant other. Probably something more like Rich & Rare. I've never had a drink. I had a sip of non-alcoholic beer when I was about 12 and that was enough to put me off. I drink water and tea, mostly. Most beer isn't very good to start with IMHO. However, I'd expect non-alcoholic beer is likely worse. Of mainstream beer I do like Corona with a lime. There are some rather tasty alcoholic beverages out there though. I'm pretty sure you didn't, but don't take my lack of interest in alcohol as in any way disparaging those that do. In fact I probably missed out on some possibly positive social opportunities because I don't drink. And I must say, if you do drink, take to opportunity to enjoy the finer options available. If Michigan contains Detroit, then I'm surprised it's only double. They have plenty of hard narcotics to exacerbate violence, both foreign and domestic. I didn't drink before 25 and I don't drink much now. Maybe 1 drink a week, usually dark beers our an occasional sliced rum. Yeah, Flint's apparently the murder capitol of the world. I learned that today, when discussing a subject unrelated to this. It's a stone's throw away, so to speak. Macallan 12 and frozen thin mints? Sure, why not! I bought some Mexican Fresca & Mexican Squirt yesterday for use in margaritas. My coworker gave a few of us his secret recipe. I was not happy to find that all Fresca sold in the US is diet (aspartame). In Mexico they sell a non-diet sugar sweetened version of Fresca. So I picked some up yesterday at a local Mexican grocery store. Now I just have to determine how much a "splash" of Fresca is by adding it to taste. The above recipe is quite bitter without the Fresca. You may enjoy the taste the most by adding up to 3 oz of Fresca. Perhaps try with 2 oz first. I ended up going with 4oz. I tried 2 and 3 first though. I also tried one with Squirt instead of Fresca. 4oz there too. 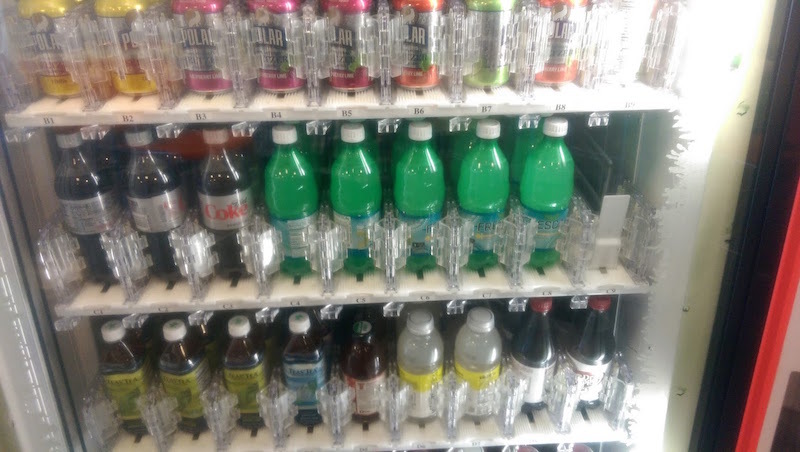 A while back the vendor who fills the soda machines at my work thought we were in need of some Fresca. I had no idea it could be considered popular enough to warrant 5 rows wide. No doubt he just ran out of the other stuff and didn't want to leave it empty. 50% has a bit of a bite to it, but the Organic is very nice and smooth overall. Some whiskies are quite harsh even if they're bottleded at 40-43%, but not this one. We did a blind Scotch tasting last week at my coworker's house. Several of us, myself included, picked the Glenmorangie 18 as our favorite. Admittedly though I'm not a scotch drinker and I'm not likely to become one. I can imagine that Glenmorangie 18 is very, very good,. I got a bottle of Glenmorangie 12 "the sherry cask finish" as a birthday gift, I'll try that one tonight. I mostly buy the standard bottlings, so it will be interesting to try something new. We preferred it to Macallan 18, Highland Park 18, Aberfeldy 21, and others. Glenfiddich 15 was my 2nd choice. Highland Park 18 is one of my favourite reasonably priced whiskies (good YPK as we say in Sweden). The Glenmorangie 12 wasn't a "must try" by th wsy, but not too bad either. I have taken to having iced tea with red wines and frozen thin mint girl scout cookies with scotch. Both sound strange but pair very well. do you guys have any odd pairing habits? I tried a few glasses of Ardbeg Uigeadail, not bad at all... No taste of alcohol despite the 54,2% strength. There are actually alcohols that are illegal in some part of the world (early 1900s), one of them is Absinthe. Google it up and see what effects it has on those who drink it. Dr. Pepper and Blueberry Stoli. Sounds a bit too sweet? The sweetest drink that was ever my "regular" was Bacardi "O" and soda when I was a teenager. Yup, it can be a bit sweet. My cabinet was empty, except for the blueberry Stoli. The Stoli was not mine, as I am not a vodka drinker. But the combo of the blueberry taste from the vodka and the plum taste from Dr. Pepper worked. I was surprised. With some experimentation I've hit upon a pretty tasty margarita recipe. That new "Sangrita Blast" Mountain Dew is pretty good. Nothing I would want to drink all the time, but it starts off sweet and gives you a refreshingly sour kick in the tastebuds as an aftertaste. I thought 21 was the legal age for alcohol in the States. Here, it's 18. Anyway, moderate your alcohol consumption while you're still in your teens. While you don't realize it, your brain hasn't fully developped yet (hence why most teens have trouble with risk assertion) and early alcoholic intake can impede your intellectual faculties later in your life. Water, juice and milk, while boring, are the most appropriate drinks until you reach your twenties. Coffee is acceptable too, although with moderation (2 per day, 3 max).